It is often believed that smaller rooms should not be too busy not to make the room look smaller... In the case of powder rooms however, I often tend to go the opposite direction. I find that because they are small, they are actually a great opportunity to have Fun with them, to be daring and Bold, whimsical or make a statement. Dare to have fun with your powder room! You almost can't go wrong... In this example I completely indulged in a beautiful polished nickel and crystal pendant light, elegant two tone damask wallpaper, beadboard Moulding at bottom all around, crown Moulding, an ornate Victorian style mirror, a bold black and white pattern mosaic as floor tiles, mirrored vanity etc everything bold, glam that can make a statement were combined to form this French inspired elegant powder room. 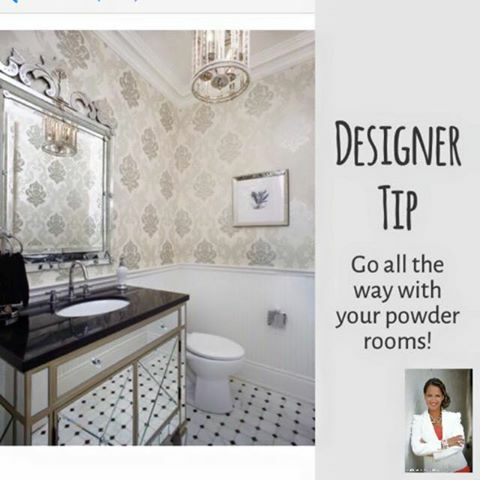 Try changing a few things in your powder room and see where it takes you. Don't be afraid to go all the way!